Earon Carter of Carter Machine talks classic paintball history regarding the Annihilators, Sat Cong Village (SC Village), the Sat Cong Headhunters, Bud Orr of WGP and more with Paul Schreck and I. We visited Earon on August 10, 2012 and recorded several interviews. 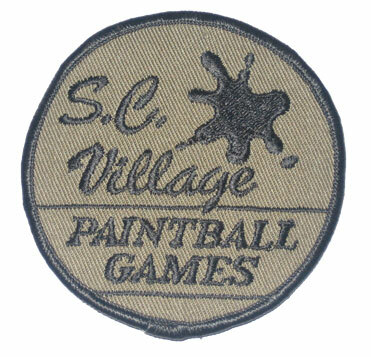 Late 80s early 90s SC Village Patch, harder to find in this OD Green color. From the collection of Gramps and Grizzly, used with permission from Mike ”Grizzly” Grubb. In this short video Earon talks about the introduction of the Annihilator / Marauder into the Southern California Paintball scene. This would have been in mid to late 1986. 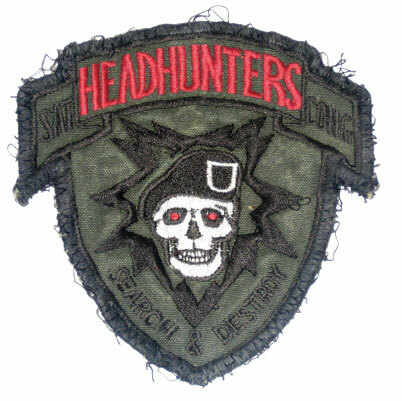 Sat Cong Headhunters Patch. One of Sat Con Village’s hottest teams in around 86/87. From the collection of Gramps and Grizzly, used with permission from Mike ”Grizzly” Grubb. In their first game using the Annihilators, Earon’s team, likely the Widowmakers, “absolutely overpowered” the Sat Cong Headhunters, SC hottest team at the time. After beating the previously undefeated SC Headhunters with their Annihilators, Headhunter member, gun tech and Operator of Gunner’s Place, Steve “Gunner” Tetz approached Earon Carter and Stan Russell about building a fleet of Annihilators for him to rent out. First generation Annihilator sold by Earon Carter. Left feed, highlighted Assault Line Stock, bead sight (broken fluoescent on it). Bud Orr of WGP also inquired about purchasing Annihilators / Marauders from Earon and Stan to rent out of his “Ice Cream Truck” gun stand at Sc Village. 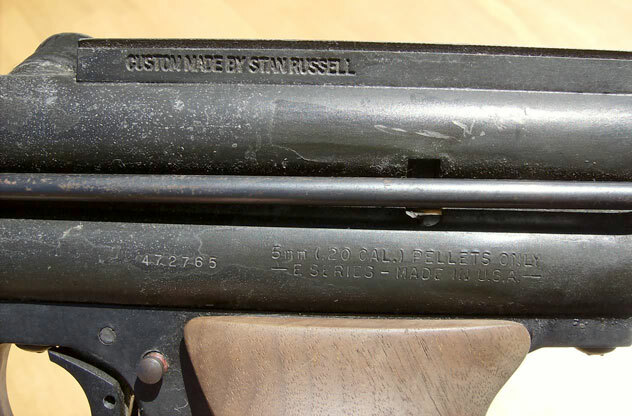 Earon and Stan had already agreed to provide “Gunner/Gunny” with pumps so as Earon says they couldn’t be building them for Bud at the same time. 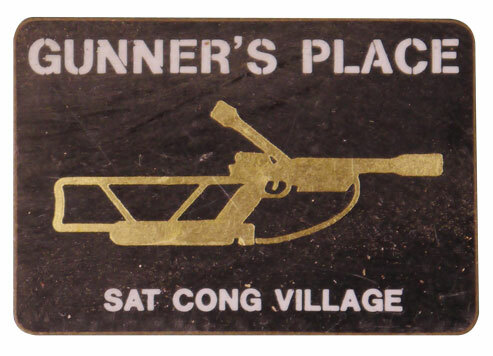 ”Gunner’s Place” brass(?) sticker off of Bob ”Flex Hone” Fowlie’s tool box lid. After word spread about the advantage a player with Annihilator firepower had, the 1st generation Annihilator became the hottest gun in Southern California. Gunner’ special Annihilator that popped up on Southern California Craigslist several years back. Pictures are from the seller. 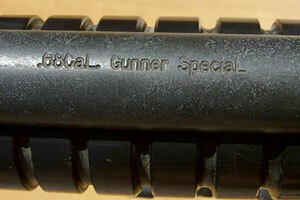 “Gunner’s Special” engraving on Annihilator likely made for Headhunter team member. Earon and Stan at South Bay Arms were building Annihilators for Tim McMurray at Mac-1 and at the same time began building and selling their own version which was essentially the same with minor differences named the Marauder which they sold to friends, other Headhunter team members, and many other teams at SC Village on Friday nights. Tim McMurray at Mac-1 wasn’t happy about Earon and Stan selling guns on the side and it became one of the many factors that split South Bay Arms from doing the machining on the Annihilators for Mac-1. More interviews with Earon Carter, Tim McMurray, Bob “Flex Hone” Fowlie and classic gun reviews coming soon! As the secretary of the HEADHUNTERS, this Grissly guy was never a HEADHUNTER! Why would you need his permission? Thanks for the comment! I was stating that the scan of the Headhunters patch was one that Mike”Grizzly” Grub (of Gramps and Grizzly in Riverside) sent me and not a scan or photo of my own patch. I try to thank anyone who assisted in gathering the media for videos I put together. As the secretary of the Headhunters did you play on the team? What years were you associated with the team? Do you happen to know what happen to Steve Gunner Tedz? Do you have any old photos or more history on the Headhunters? I would like to know more about the Headhunters.